Today I am flying off to Iqaluit, all the way east on Baffin Island. Thanks to Jeff�s contacts in the small world of tech communications, the airline Canadian North offered to sponsor me with a free ticket to fly all the way east, with a connecting flight to Ottawa on coming Friday. (This way I skip the prairie provinces Alberta, Saskatchewan and Manitoba for a moment, but I�ll be crossing these parts of Canada later the coming months). After a quick cereal breakfast Jeff brought me to the Yellowknife Airport at 10.30 am. This time I thanked him for everything he�s done to me, and for the last time too. Jeff�s a very good person, full of ideas, straight-forward with creative thoughts and apparently he likes to help out strangers. The B737-200 combo plane departed as scheduled on 11.30am. Within half an hour two lady stewards brought around drinks and lunches. Apparently I was listed as a no-priority guest flying on board, so �there is no lunch for you�, one of them told me. I am in no position to complain as I had not paid a cent for this flight, but it was a bit odd anyway, I thought. Canadian North sponsored me with this flight and here I am treated as a person who evidently got his tickets with discount coupons or something. It would be a four hour flight with a one-hour-stop in Ranklin Inlet (also known as Kangiqliniq), a very remote on the west flanks of the big Hudson Bay (that big water splash in the middle of the country�s map). Fortunately I was offered some stacks of Oreo cookies and bags with salted almonds. And I could drink as much 7Up as I wanted! But the fact that I as surrounded by the warm aromas of fish steaks and fried chicken with salads and fruit parts did however make my stomach roar. Darn, I am spoiled! (I guess my seat on the plane was simply arranged �along the side� and I wasn�t listed on the catering list that way). The second part of the flight, from Ranklin Inlet to Iqaluit, I forgot all about this no-lunch stuff. The stewards were bringing around coffee with a big shot of Baileys liquor! It was warm and smooth and�. very good. I love Canadian North! 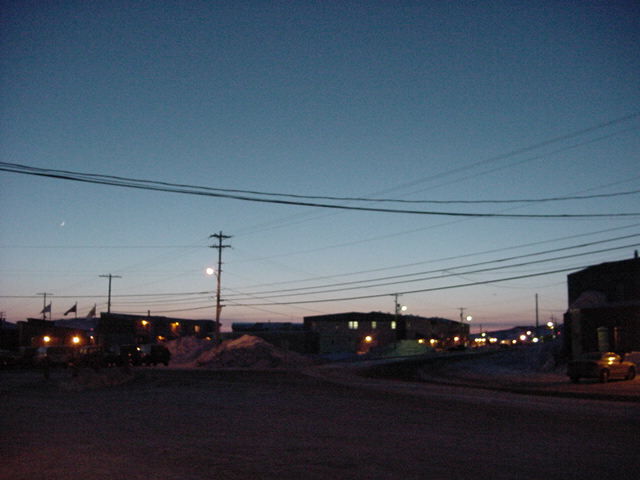 However the flight left Yellowknife at the end of the morning, I arrived in Iqaluit around 6.30pm in the evening. With this big jump over the north of Canada I also had to give in with two hours as I landed in the time zone of the Canadian East Coast. If Mexico City is the largest metropolis on Earth, then Iqaluit easily gets the same label within the new territory of Nunavut (seen the Nunavut Handbook yet?). When I arrived at the lively Iqaluit Airport, I felt as though I had entered a frontier town. In several ways, I had. Iqaluit is the transportation hub to other Baffin Island communities (see map), as well as to Greenland (Denmark). And in December 1995, it was selected to be the capital of the new central and eastern Arctic territory. The main portion of Iqaluit (pronounced "ee-ka-loo-eet") overlooks Koojesse Inlet, which has some of the country's longest stretches of exposed area at low tide. At one time, these beaches were dotted with clusters of Inuit huts. Later, as modern houses, shops and public buildings were constructed, this little village grew to reflect its increasing population and looming importance as a government town. An distinct but interesting side industry is the southern movie business; actors and directors have dropped in to town from time to time to film authentic Arctic location shots. Iqaluit's population too is a mix: a mix of cultures (less than two-thirds of residents here are Inuit people, compared to other communities that are more than 90 per cent Inuit) and languages. The United States airbase to the north of town used to be separate from the main village, with a road linking the two sites. What was once wide open country is now one large urban development. Thousands of years ago, when Iqaluit, like the rest of the Arctic, was still unexplored wilderness, the ancient explorers of the Dorset and Thule cultures hunted and camped on this pure and silent land. The lands and waters here were prime hunting and fishing grounds; local vegetation provided edible plants and berries in season. These nomadic hunters would remain as long as there was game, then move on to other areas where animals were more plentiful. In 1942, during the Second World War, the U.S. Air Force, with the blessing of the Canadian government, selected Iqaluit as an ideal site to build an airstrip. It was to be long enough to handle large aircraft transporting war materials from the United States to its European allies. During this time, many Inuit from surrounding hunting camps were recruited to help construct the airstrip, aircraft hangars and related buildings. These hunters and their families had no choice but to begin building year-round huts on the beaches of Koojesse Inlet, using wood discarded from the airbase and the local dump. 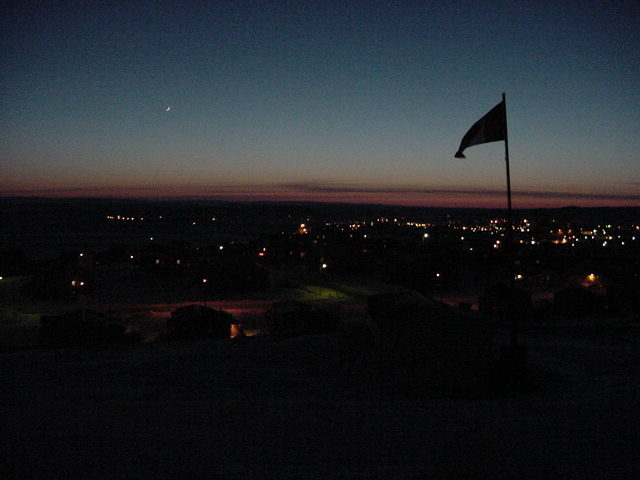 The Inuit referred to the little village that grew here as Iqaluit, meaning "fish". Fish, especially arctic char, flourish here in spring and summer, after their swim down the Sylvia Grinnell River, two kilometres west of the village. They reappear in droves in autumn, when it's time for them to swim back up to Sylvia Grinnell Lake for the winter. Before long, the village, together with the airbase and Apex Hill (its previous name), appeared on official government maps as Frobisher Bay. And this is how it came to be known to the outside world. The name was in honor of Martin Frobisher, the English sailor who "discovered" the bay in 1576 while searching with his crew for the Northwest Passage to the Orient. Frobisher made three voyages to the bay, mainly to mine black ore from Kodlunarn Island at the mouth of the bay. Frobisher believed the island contained gold. Several conflicts with local Inuit followed; in one incident, Inuit took five of Frobisher's men hostage. They were never heard from again. In other instances, Frobisher captured four Inuit whom he took back with him to England, presumably to display to the Royal Family and to the curious English public. The Inuit did not live long in that strange land. In another clash with Inuit, Frobisher was stabbed in the buttocks by an arrow, earning him the dubious distinction of being the first Englishman known to have been wounded by an Inuk. As for the precious ore he and his men carried to England, it turned out to be fool's gold! Thus ended Frobisher's quest for polar gold and his explorations of the lands and waters beyond the bay that later bore his name. In the 18th and 19th centuries, other explorers and whalers from Europe and later, North America, embarked on similar northern expeditions. The impact of western culture intensified in south Baffin Island when missionaries arrived, spreading the Christian religion that would replace centuries-old Inuit shamanistic rituals and beliefs. Like other Inuit communities throughout the North, Iqaluit couldn't escape westernization of its traditional culture and heritage. The Hudson's Bay Company trading post, for example, moved to Iqaluit in 1950 from Ward Inlet, almost 50 kilometers south on the north coast of Frobisher Bay. By 1957, Iqaluit had a population of approximately 1,200, of whom 489 were Inuit. The United States turned over its airbase to the Royal Canadian Air Force after the Second World War. By 1963, the Americans had gone, and Iqaluit was to become the Canadian government administration, communications and transportation centre for the eastern Arctic. At the airport I was picked up by my Inuit host Adamee Itorcheak, already known to me as a good old friend for as well Jeff Philipp in Yellowknife and Gwen and Fred Lepine in Hay River. For as far as I knew Adamee, an Inuk by heart and soul, is the president of the Internet Service Provider Nunanet.com. And he is a skilled hunter. �I am a bum, just like you,� Adamee laughed and I figured out he was pretty envious of my way of travelling and wasn�t hiding that at all. Adamee speaks English as his second language. His native tongue is the Inuit language Inuktituk. Adamee is also a very hyper-active person. He speaks very animated about Iqaluit, expresses amazement about me, tells me how many various words Inuit have for �snow�, expresses amazement about me again and tells me again he is a bum. And then he would express his amazement about me again. At his home on the hills of Iqaluit I met up with his Inuit family; his wife Eva and their two kids. It was shoes off, shoes on for a few times. 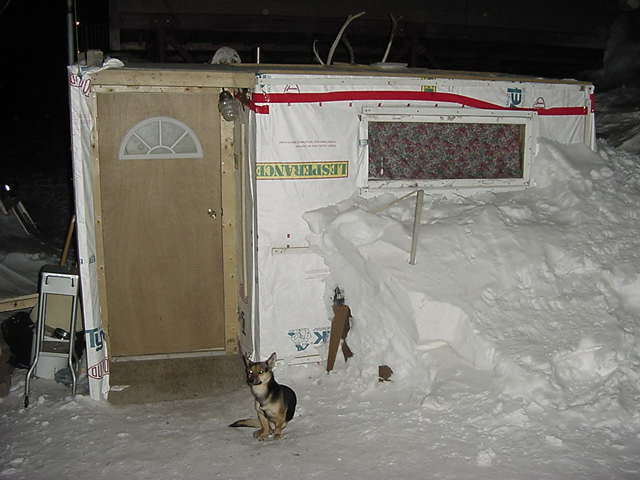 As Adamee wanted to show me a lot: the house (built by his brother and his father), the little carving shack around the back of the house (built by Adamee with �everything from the dump� and �it�s the biggest secret that I make rock carvings too�) or a special new sled to be used behind a skidoo. Or Adamee would ask for my mussels as he had to haul up a gas tank on a sled. When I finally sat down on their couch in their living room, Eva told me to �just feel at home�. She was cutting caribou meat on the kitchen floor. Then Adamee would walk in again and take me along. �Let�s get dinner out, I am hungry,� and he took me along to a Chinese restaurant across the street of his office in town. In the car he tried hard to explain to me how life in Iqaluit is. But he came up with so many pieces of a puzzle that I couldn�t figure out where he was going. �Sorry, I think faster than I speak.� And with a bit of directing from my side I could follow his story. �It is good somebody like you is here,� he said, �You get me back down to the basics again.� He laughed. He also introduced me to many people in town that would pass us by today and told them in all that Inuktutuk I am a bummer. �He travels around the world for free,� he says, sometimes even in Inuktituk. �With a website!� Eyes stared at me and I would just gawp back with a smile. Back home I met some of the other guests staying at the Itorcheak house. One friend of the family arrived from Ottawa today and will be leaving to Pangnirtung, up north on Baffin Island, in a few days. When I asked why anybody would do that for fun, Adamee told me: �Because he is crazy. Just like you!� I suppose he had a point there. After dinner I joined the family on the living room couch. We watched some television and before I knew Adamee woke me up. The couch would be my bed for the night, but apparently I fell asleep already. It was around 11pm when I noticed everybody else had disappeared. Adamee handed me some sheets and blankets and wished me good night.